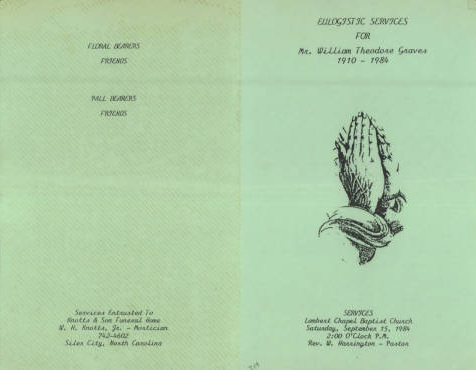 The Chatham County Funeral Programs exhibit documents the lives and deaths of several generations of Chatham County residents. 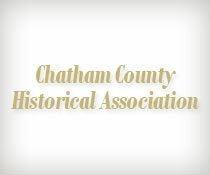 The collection was established with the donation of nearly 800 programs to the Chatham County Historical Association by Ms. Annie Ruth Burnette in 2011. Additional programs have been contributed by Ollie Crutchfield Burnette, Phyllis Fearrington, and Arzalia Nettles Taylor. Covering funerals held between 1957 and 2014, the programs typically contain an obituary, a list of surviving relatives, and the order of service. Many also contain a photograph of the deceased. The programs are an excellent source of genealogical information, often including birth and death dates, maiden names, names of relatives, past residences, and place of burial. Collectively, the obituaries provide a rich source of local history about African Americans in Chatham County and neighboring communities. Alston, Brenda Carol Farrar, 1947-2005. Alston, Clattie Louise Brooks, 1917-2010. Alston, Emma J. Harris Alston, 1929-1967. Alston, Fleta Marie Glover, 1929-2003. Alston, Jeffrey L., Jr., 1991-2007. Alston, Martha Elizabeth Lee, 1918-2007. Alston, Mary Ann Emerson, 1902-1997. Alston, Mary Elizabeth Horton, 1924-1995. Alston, Mary Kate Cotten, 1897-1969. Alston, Richard Lee, Jr., 1961-2004. Alston, Sandra K. Foxx, 1946-2005. Baldwin, Ella Viola French, 1924-1999. Baldwin, Hattie Hall Harris, 1897-1980. Baldwin, Robert L. Jr., 1942-2008. Barbee, Elsie Foy Alston, 1932-1993. Bland, Henry Jackson Sr., -2011. Bowden, Margaret Headen Williams, 1917-1992. Bowden, Thelma Louise Paige, 1924-1972. Bronson, Kathy Lucille Watson, 1950-2001. Brooks, Bertha Ruth Thompson, 1951-1996. Brooks, Exie Mae Matthews, 1924-2007. Brooks, Pearlie Mae Williams, 1923-2005. Brooks, Samuel Bernard, Jr., 1952-2003. Browner, Stella Carleen J., 1923-1967. Burnette, Bessie Mae Frazier, 1907-2003. Burnette, Gloria Lucille, Walden, 1931-1985. Burnette, Lelia Mae Marsh, 1943-1999. Bynum, Allie Mae Bass, 1915-1988. Bynum, Flora Jane Cotton, 1906-2005. Bynum, Jessie Lee Palmer, 1910-2005. Bynum, Rufus Goldston, Sr., 1914-2001. Cassady, Dora Rena Siler, 1909-1984. Cassady, Larry Edward, Sr., 1948-1995. Caviness, Virtle Lee Cheeks, 1914-2005. Chalmers, Mary Lois Price, 1928-2004. Chavis, Mary Louise Baldwin, 1920-2008. Chavis, Thomas June Jr., 1926-1982. Cheek, Elizabeth Tina DeGraffenreidt, 1913-2003. Cheek, Inez Spinks Cheek, 1928-1997. Cheek, Johnny Franklin Cheek, 1946-2001. Cheek, Linda Caroline Marie Farrish, 1951-1971. Cheek, Mary Alice Harris, 1911-1988. Clark, Howard Lee Sr., 1920-2010. Coble, Michael W. Taft, 1909-1983. Cole, Lois Eva Virginia Jones, 1896-1980. Coltrane, Lue Matthews H., 1890-1974. Compton, Betty Lou Penny, 1945-1999. Cotton, Annie Pearl Brim, 1929-2004. Cotton, Fred Douglas, Jr., 1913-1999. Crawford, John Ethel Townsend, 1928-1997. Crump, Naomi Elizabeth Thomas, 1934-1999. Crutchfield, Annie Marie Degraffenriedt, 1911-2008. Dalton, Sadie P. Headen, 1920-1994. Dark, Mary Helen Headen, 1924-2005. Dark, Naomi Mariah Elizabeth, 1911-2006. Davis, Jessie Carol Foxx, 1945-2005. DeGraffenreidt, Edna Lee Jordan, 1930-1994. Degraffenreidt, Callie Mae Marsh, 1926-2003. Dunlap, Richard Carson, Sr., 1934-1995. Edwards, Cecelia Ann Reives, 1944-2003. Edwards, Minnie Lou Williams, 1944-2011. Edwards, Mishie Odelia Walden, 1894-1967. Elder, Clara A. Price, 1919-2005. Emerson, Allean Ellen Baldwin Brooks, 1914-2005. Emerson, James Dalton, Jr., 1945-2001. Emerson, Marian Helen Elizabeth Nettles, 1932-2010. Farrington, Maggie Leona Cotton, 1930-2006. Farrington, Mildred L. Bailey, 1924-1999. Fearrington, Phyllis Fair Lace Iola, 1939-2005. Fleming, Mae Johnnie Dowdell, 1933-2005. Fox, Mary Frances Alexander, 1932-2005. Foxx, Annie Lois Glover, -2007. Foxx, Lillian Ruth Edwards, 1915-2005. Fuller, Eva Leona Goins, 1906-1989. Gathings, McCoy Cheek Staley, 1933-1999. Glover, Ervin Joe Glover, 1936-2000. Glover, Ossie Marie White, 1936-2008. Goins, David Albion, Sr., 1909-1987. Goins, Essie Irene Williams, 1924-1994. Goldston, Genive Ada Foushee, -1975. Gowins, Jessie Lee Headen, 1927-1997. Graves, Augusta Ann Marsh, 1896-1997. Graves, Etta Louise Siler, 1915-1978. Graves, Rossie M. Graves, Jr., 1939-2001. Gray, Charlie W., Sr., 1936-2003. Green, Don Wendell, Jr., 1985-1997. Griffin, Ruth Virginia Eubanks, 1938-1999. Gunter, Joseph C., Sr., 1928-1997. Gurity, Johnsie Mae Cheek, 1925-1997. Harris, Annie Mae Perkins, 1926-2008. Harris, David Herman Sr., 1920-2009. Headen, Annie Mae Johnson, 1933-2003. Headen, Elma Mae Sutton, 1920-1998. Headen, Henry Garrett, Jr., 1942-2007. Headen, John Cleveland Sr., 1920-1988. Headen, John Wayne Foster, 1944-2007. Headen, Lillie Bane Rives, 1924-2008. Holt, Shirley Lee Matthews, 1946-1999. Horton, Mattie Mozelle Cundiff, 1903-1989. Ingram, Johnnie Phillip, Sr., 1936-2007. Johnson, Annie Mae Alston, 1917-2004. Johnson, Katherine M. Howard, 1938-2007. Johnson, Lossell Aaron Jr., 1944-1993. Johnson, Marion Estella Brower, -1998. Johnson, Mary Ethel Scurlock, 1920-1982. Jordan, Barbara Ann Page, 1938-1995. Knotts, Nettie Mae Ingram Knotts, 1929-2003. Knotts, William Harvey, Sr., 1926-2005. Lake, Maggie Bell Brooks, 1923-2012. Lambert, Douglas J. Sr., 1919-2007. Lane, Gracie Zenoby N., 1910-1992. Leak, Mary Jane Richardson, 1916-1992. Ledwell, Dorothy Dean Ellen Brooks, 1943-2003. Lee, Henry Major Sr., 1900-1978. Lee, Jennie Young Stroud, 1896-1986. Lee, Lillie Grace Perry, 1901-2000. Lee, Mary Lou Paige, 1933-1999. Lineberry, Julius Clarence, Sr., 1919-2006. Lynn, Elsie Mae Horton, 1927-1993. Maloy, William Edward, Sr., 1917-1996. Marley, George Henry Leroy, 1908-1969. Marsh, Annie Alston Emerson, 1900-1976. Marsh, Mary Louise Taylor, 1946-2002. Martin, Kelly Gene Headen, 1966-2005. Martin, Linda Marie Taylor, 1947-1988. Mason, Izona Frances Peoples, 1922-2008. Matthews, Linda Carol Alston, 1959-2011. McCrimmon, Willie James Thomas, 1951-1994. McDonald, George T. Cameron, 1929-2003. McLeod, George Franklin, Jr., 1948-2008. McLeod, George Franklin, Sr., 1910-1964. McNeill, Martha Ann Thomas, 1911-1996. Milliken, Edward Rochelle, Sr., 1940-2005. Mitchell, Mable Artence Price, 1916-2006. Mitchell, Maude Cheek Travis, 1934-2004. Mitchell, Rosetta Polite Jones, 1914-2006. Morgan, Emily Jane Alston, 1940-2002. Nelson, Mable Alice Thomas, 1896-1996. Nettles, Ada Mae Baldwin, 1898-1967. Nettles, Herman John Plummer, 1941-1977. Nettles, Pauline Lee Williams, 1921-2004. Page, Cara Lee Mason, 1915-1999. Page, Harold Nathaniel, Jr., 1949-1993. Paige, Arthur Benjamin Louis, 1972-1995. Paige, Carrie Jane Headen Brooks, 1899-1996. Paige, Joseph Clemont, Sr., 1930-2002. Palmer, Alice Faye Spinks, 1940-1970. Parrish, Ella Louise Rone, 1948-2009. Patterson, Ellen Ruth Reives, 1925-2005. Payne, Annie Belle Hanner, 1910-1984. Penny, Carolyn Ann Harris, 1953-2008. Perkins, Kattie Mae Lee, 1921-1992. Perry, Julian Walker Sr., 1922-1986. Pierre-Louis, Brenda Joyce Wooten, 1951-2001. Pippin, Susan Gail Brooks, 1956-1994. Pratt, Ada Mae DeGraffenreidt, 1933-2010. Pretty, William Pretty, Jr., 1943-2003. Price, Daisy Mildred Brooks, 1921-2006. Price, Jabe Wilbert Turner, 1898-1984. Price, John Robert, Jr., -1995. Price, Queen Esther Marsh, 1910-2006. Price, Ruby Mae Harriette, 1934-1993. Price, William Harrison, Jr., 1919-1993. Pugh, Edna Pearl Farrar, 1923-2007. Ramsey, James Elbert Sr., 1909-1996. Raymond, Lucy Odessa Fearington, 1928-1995. Rieves, Vincent Ray, Sr., 1952-1997. Rodgers, Mable A. Chalmers, -2007. Rodgers, Willie David Jr., 1914-2010. Rogers, Lillie Mae Nettles, 1927-2008. Scotton, Maggie Bell Price, 1918-1993. Scotton, Sarah Dollie Spinks, 1929-2005. Scurlock, Bessie Mae Alston, 1929-2013. Short, Marianna Brooks Nettles, 1930-2007. Siler, Alice Faye Foxx, 1943-2004. Siler, Billy Siler, Sr., 1930-2005. Siler, Callie B. Watson, 1926-1990. Siler, Ina Bell Cheek, 1917-1969. Siler, Ola F. Alston, 1902-1993. Siler, Robert Edwards Lee, 1918-1979. Siler, Sophronia Jane Foxx, 1915-1998. Singletary, Martha Marea Emerson, 1904-1999. Smith, Margaret Ann McSwain, 1926-2004. Spinks, Myrtle Lee Siler, 1926-2000. Spruill, Rosa Lee Baldwin, 1946-1979. Strowd, Mary Kate Cotten, 1922-2004. Thomas, Ida Mae Knotts, 1924-2004. Thomas, Jannie Frances Foxx, 1949-2008. Thompson, Robert Lee, Jr., 1952-1985. Toomer, Lillian Verline Nettles, 1939-1998. Tyson, Lacy Lassiter Winslow, 1917-1998. Tysor, Nina Jane Header, c. 1875-1965. Walden, Alice Faye Horton, 1942-2005. Watson, Joncie M. Johnson, 1911-1998. Weaver, Mable Louise Springs, 1922-2008. White, Audrey Viola Marsh, 1914-2003. White, Martha Frances Bailey, 1943-1997. Williams, Ella Louise Headen, 1924-2006. Williams, Jennie Marie Young, 1916-2006. Williams, Joyce Marie Smith, 1956-2009. Williams, Mary A. Moore, 1911-2004. Williams, Nettie Lillian Kirby, 1924-2010. Wilson, Eloise Taylor Cole, 1936-2010. Wilson, Richard Marcellous Jr., 1979-2009. Winstead, Ruby Gean Glover, 1954-2007. Womble, Dalis Gray White, 1926-1998. Womble, Sarah Beatrice Freeman, 1932-2004. Young, Ida Elizabeth Taylor, 1913-2011.